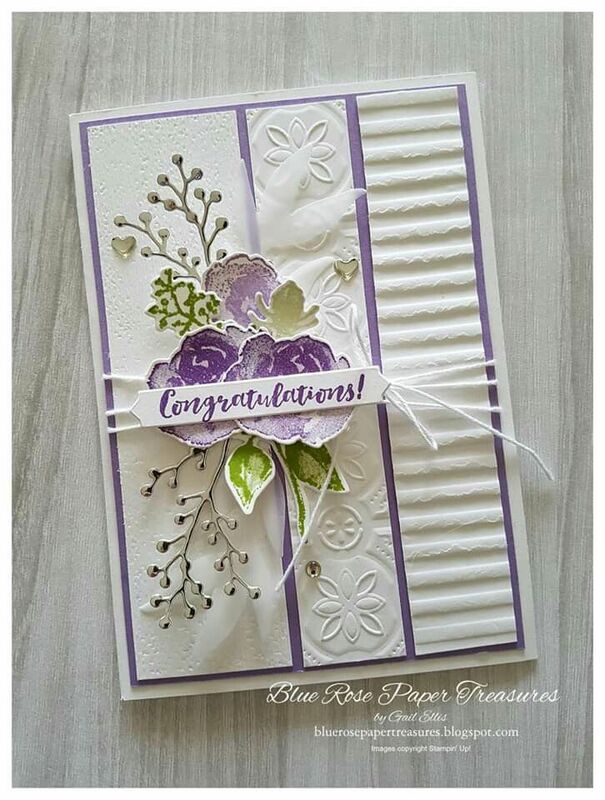 The card I am sharing today is an easy, elegant card. It uses the stamp set from SU! called Timeless Textures. I also introduced a NEW stamp set from the soon to be available Occasions Catalog called Humming Along. You wouldn’t have to do as many layers as I did, but you know that I LOVE layers! This card was inspired by a card I saw on Pinterest by Wanda Pettijohn . Don’t Gorgeous Grape and Granny Apple Green look great together? That is my favorite color combo! If you would like to receive the NEW catalog, let me know and I will mail you one! Below are all the supplies used in picture form, click on any of them to be taken to my OnLine Store! If you are in search of a Demonstrator from Stampin’ Up!, I would love to become yours! All Online orders receive a gift from me! Thank you for stopping by! I hope you return again soon! Instead of making a page (I’ll do that too, I’m sure), I decided to make a card. This was so much fun!! If you want to watch me make it, go here to see my video! I’m so happy that SU! has Blends (Alcohol Markers) in black now! It sure makes coloring things easier. This little witch is so cute, of course she is a good one! Her kitty is too cute, love the expression. I wanted to have a card the opens a little differently. I die cut the sentiment tags using a die from Still Night stamp set. The one in Gorgeous Grape is the size of the die. I put the die through twice for the Granny Apple Green and Whisper White, to make it smaller. If you put the die over the long one, line it up so the middle is along the lines of the die, you can cut it as small as you want. It gives it a very nice edge. Underneath the Sentiment attaching to the other side is a small piece of Dual Lock. It works like Velcro, but MUCH better for paper since it won’t pull too hard, it snaps into place. Check out my video to see how it works! Don’t these colors go well together? I hope you like my Halloween card! I had a blast making it! Below are pictures of all the supplies used for this project. Click on any picture to be taken to my OnLine Store.